How many times have you thought about things you did when you were young that you would never share with your parents? Or maybe you are willing to tell them, but not until you've moved out of the house and feel like they can laugh about it with you. I know I have plenty of those stories, but I'd never share them with my parents! I have told my friends and my husband, but I wouldn't dare tell my parents! Not that what I did was illegal or immoral, just that I don't want them to shake their head and think they raised a moron. What I liked about this book is that it is comprised of stories that the creators have looked over, chosen as the best and edited for the book based on what I'm sure numbered in the 100s. They narrowed it down to 59. From the very first story, I was hooked and here's why. My ex-husband's grandpa used to tell stories of his childhood. Of course, you never hear about these wild stories until you become and adult and then your parents and grandparents are ready to share. Anyway, he used to tell us about how you could drive cars across the Mississippi in his home town because the ice would get so thick. I kept thinking about how crazy that seemed and I would never have the guts to do it! Well, guess what... apparently a lot of guys had the guts to do it back in the day (and probably today). One of the first stories was a similar one about a group of boys who had nothing to do one day, not enough gas to drive very far, so they decided to drive on a frozen lake. I won't tell you what happened, but obviously since he was able to tell the story, he survived the experience! The book is categorized into the types of events that the different stories pertain to and each are told from the culprits point of view. If you ever did something off the wall, then I'm sure there are at least a couple of these stories you can relate to! I would definitely recommend this for your own read, but think it would also be a great gift (think Christmas!) for any adult. I almost said it would be a good gift for a teen, but then realized they might get ideas... so scratch that unless you think they can be trusted not to pull any crazy stunts! "Theres nothing worse than getting caught with your hand in the proverbial cookie jar, yet alone confessing to all those stupid things you did when you were a kid and lived to tell about. Yes, you know where the bodies are buried. Inside, youll read stories about crazy capers, double-dog dares and outlandish adventuresthose youthful escapades you never shared with your parents! Thus the reason to hide this book from your youngsters and especially your teenagers . . . you might give them ideas! Exactly 59 authors from all over the US and Canada contributed original stories that have been published in the newly released book, Not Your Mothers Book . 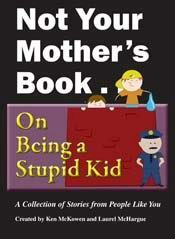 . . On Being a Stupid Kid, the lead title in the edgy new entertainment series by creators Dahlynn and Ken McKowen"